Among the VIPs at Art Basel Miami Beach (ABMB) this year will be two long-time collectors who won't be wearing Versace, partying all night, or be interested in buying the works of artists like Damien Hirst or Andreas Gursky. 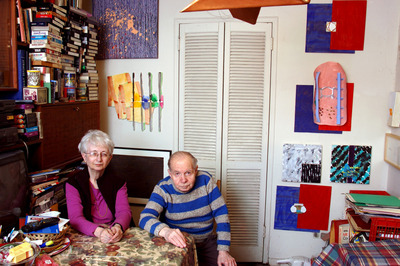 Dorothy and Herbert Vogel, a retired librarian and postal clerk respectively, have, since the 1960s, amassed one of the largest and most important collections of contemporary American art. And all on his salary alone. The Vogels have nothing against fairs; it is just that, to them, these extravaganzas are a fairly recent phenomenon. Mrs. Vogel (aged 73) and Mr Vogel (86) are in Miami "to see a lot of people and see a lot of art," as well as attend a screening of "Herb and Dorothy", a documentary film about these remarkable art collectors made by Megumi Sasaki. Not that the Vogels have stopped collecting. "We've never shopped at fairs, but we've looked," says Mrs. Vogel. In their small apartment in Manhattan, the spaces free of art or art books are few and far between. Just outside the kitchen are sculptures by Steve Keister, along with works by Pat Steir and Richard Tuttle, for example. They made their most recent acquisition in August: drawings given by the U.S. minimalist Robert Mangold—an old pal. The newest artists in their collection are James Siena, added in 2006, and Louise Fishman, in 2007. As Mr. Vogel isn't very mobile nowadays, the pace of their collecting has slowed. They are also collecting less as the market has changed. "It's more expensive across the board," he says, with even young artists commanding high prices. It is also more international and, to them, less appealing. "I'm glad we were around when minimalism and conceptualism came about," says Mrs. Vogel. "I don't like nasty things, grotesque things, things with teeth. "I'm not saying they're bad works, but we have to like it [tobuy it]," she says. Hence the Vogels' lack of interest in artists like Hirst and Gursky. Names such as Sarah Lucas and Tracey Emin mean nothing to them. They do, however, like Thomas Struth, and they have bought drawings from Jeff Koons. Mrs. Vogel says that depth—they have many pieces by the likes of Sol LeWitt, Mangold, Tuttle, Robert Barry and Edda Renouf—is the strength of their collection. The Vogels made history in 1992 when they pledged their collection (then numbering about 2,000 paintings, sculptures and drawings, now double that) to the National Gallery of Art in Washington, D.C. The gallery has added about a thousand of these pieces to its collection. It is distributing the rest in 50-item lots to an art museum in each U.S. state. The project, "Fifty Works for Fifty States," has been supported by the National Endowment for the Arts and the Institute of Museum and Library Sciences. The Vogels say it would be hard for anyone now to do what they did. Over the years, as they visited galleries and museums, they made friends with artists such as Mangold,Steir and LeWitt. "Artists wanted to get into our collection," says Mrs. Vogel, which explains how they acquired many of the 4,000 works of art. "People treated us differently from beginners because we'd proven ourselves," she says. Now, "the whole market is about money," says Mr. Vogel. "Art has become a commodity." But Mrs. Vogel believes that would-be followers could buy mid-career artists who are not recognized, perhaps someone without a gallery or someone whose gallery has closed. The Vogels say they have come to ABMB simply because they were invited, and because they want to support Megumi Sasaki. "She did a wonderful job" with the documentary, says Mrs. Vogel. "She captured us the way we are. She worked very hard, and she agonized over it. "I've never been to a fair like this—out of curiosity, I'd like to go see it," she adds. And there is always the chance to connect with a new artist, renew an old acquaintance or even—just maybe—buy something.